Tis’ the Season to be in Granbury. Visit Granbury during the holidays to feel the true magic of Christmas with your loved ones! 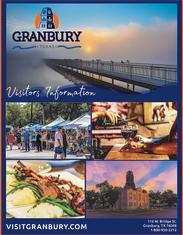 There is so much to see and do in Granbury this Christmas, so come on out! Make this Christmas season one to remember with the many traditions, twinkling lights, holiday festivities, “Night of Lights” parade and free appearances by Santa and Mrs. Claus in Granbury. Another great seasonal event is the Candlelight Tour of Homes around the Historic Granbury Square. Step inside some of Granbury&apos;s oldest homes, preserved and decorated in the spirit of Christmas. You can feel the stories unfold as you walk each elegant and historically relevant home. Enjoy hundreds of Nativity sets from all over the world! This private collection will be on display for a short time in December, and you won&apos;t want to miss it! The Granbury Living Christmas Cards is an outdoor, interactive family event on the Historic Granbury Square. This holiday extravaganza is a partnership between Lakeside Baptist Church, the City of Granbury and Hood County. These unique displays and fun interactions will take you on a whirlwind tour from sleigh bells and chestnuts to the Bethlehem manger, where the true hope of Christmas can be found. With the backdrop of the gorgeous Granbury, Texas and its friendly merchants, you and your family are sure to make memories that will last a lifetime. Make it a romantic holiday getaway with these events, stay in a local bed and breakfast, and enjoy the twinkling lights and festive trees around the Historic Granbury Square. Make this Christmas unforgettable!